Also known as pamphlets, are great handouts and sales pieces that allow businesses to quickly and effectively display their information along with the products and services they offer. Choosing the right layout can be challenging, especially if this is your first time printing brochures. Before deciding on the brochure folds, there are some questions you may want to ask yourself. What is the overall purpose of them? What content (images and text) do you plan on using? Who are you trying to attract by printing them? This fold option is one of the more common and the simplest of the folds. The half fold is also known as a bi-fold or single fold. Half Fold brochure offers two equal sides, resulting in a four-pages. The half fold option allows you or a designer to display some creative ideas. This option is excellent for those who want to show large images or include a group of pictures on either side without having the fold run through them. This layout is often used to display images of product comparisons, a business menu or even a design of a map. They are also commonly used for corporate companies since the layout is flexible in this format. They are more full than the other folding options, and they can grab the attention of potential customers and clients. Keep in mind when selecting this option that they might not fit into a rack that’s often found in stores, hotels or welcome centers. If this is a concern, we highly recommend using the tri-fold option. 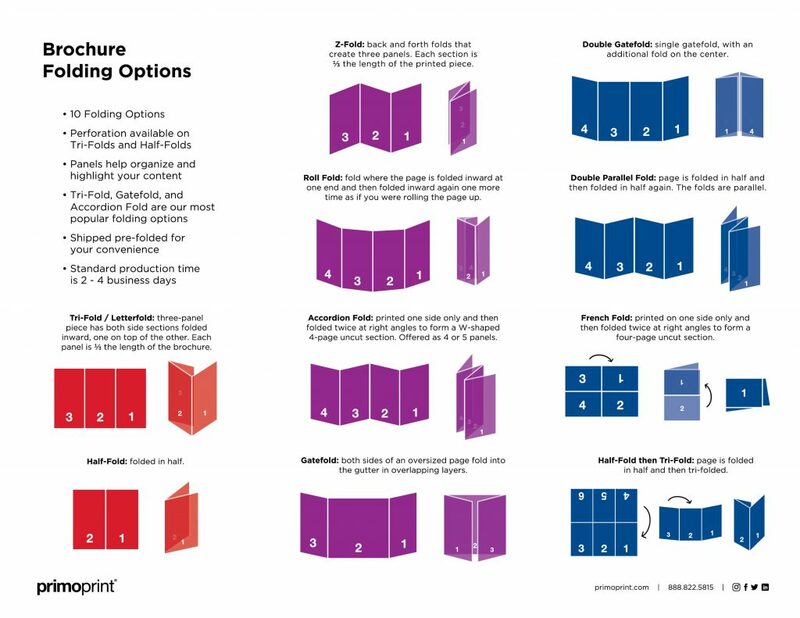 Tri-Fold brochure is a popular folding option. It is most commonly included in a marketing campaign as it is great for showcasing a business, promoting a brand, and highlighting products and services effectively. The tri-fold brochure offers two folds which form three double-sided panels, resulting in a six-panel brochure. The standard size is the 8.5×11”. They are easy to carry and hand out, easily placed into a bag or a pocket, and they take up less counter space. Keep in mind, depending on the size you select; you’ll have the option to choose a folding option; flat (no folding), half-fold, tri-fold/letter fold, and z-fold. Please contact us with any questions or concerns regarding your brochure printing options. When you want to create a dramatic opening, the gate folded brochure is an excellent choice. It instantly grabs the readers attention. They offer a wide opening and described as if two doors side-by-side are being opened at the same time. When opened or closed, the left and right sides fold inward toward each other, and they meet in the middle. By doing so, they create a seamless look when closed. This type of fold makes eight total panels, where the two sides are the same size and the middle panels are slightly more prominent. For those looking for business brochures to display images that are wide, such as a landscaping company or architecture firm, these are perfect. The gatefold also allows you to also display a lot of information, without it feeling overwhelming. But folding options do not stop with the three mentioned above. We offer a plethora of folding options, so no matter how they are going to be used, we have a fold for you! Below, you’ll find an image displaying each folding option that we offer, accompanied by a short description to help you understand them better. If you have any questions, feel free to contact us here. If you need help with a design, we can help as we now offer graphic design services.